Two Jedi Knights for the price of one! Stunning artwork from Tsuneo Sanda. Limited to just 150 pieces! You get two Jedi Knights for the price of one, with this Star Wars With You: Luke Skywalker and Obi-Wan Kenobi Paper Giclee Print! 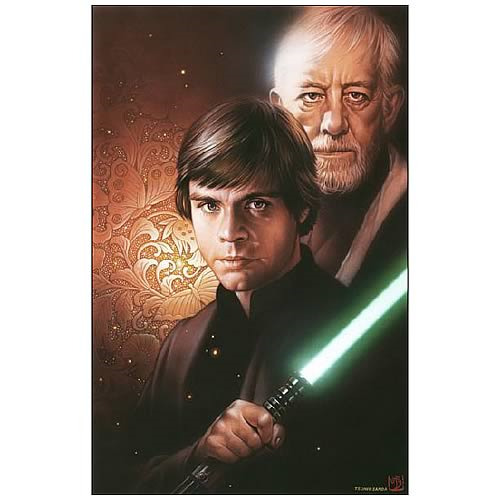 From illustrator Tsuneo Sanda, this extraordinary print captures the essences of Luke (Mark Hamill) and Obi-Wan (Alec Guinness), as they appeared in the original Star Wars trilogy. Printed on acid-free Elegant Velvet Paper, this work of art measures 16-inches wide x 25-inches tall, and is limited to just 150 hand-numbered pieces worldwide. Includes certificate of authenticity. Order yours today! Giclée (pronounced "zhee-clay") is an invented name for the process of making fine-art prints from a digital source using ink-jet printing. The word was coined to distinguish commonly known industrial "Iris proofs" from the fine-art prints artists were producing on the same printers. The name has since come to mean any high-quality, ink-jet print, and is often used in galleries and print shops to denote such. In the past few years, the word (as a fine-art term) has come to be associated with prints using fade-resistant "archival" inks and the inkjet printers that use them. A wide variety of substrates are available, including various textures and finishes such as matte photo paper, watercolor paper, cotton canvas, or artist textured vinyl. This article uses material from the Wikipedia article "Giclée" and is licensed under the GNU Free Documentation License.